It’s the month of Neuroscience, the biggest collection of conference posters maybe anywhere. Lots of people offered advice for presenting posters at that conference, which has the advantage of applying to almost any other conference you might attend. Neuropolarbear gives advice on presenting a poster: be able to do it in less than 5 minutes. Don’t even practice a longer version. If people want more detail, they will ask about the parts they care about. That’s the brilliance of a poster, as opposed to a talk. Ask the person to tell you why they are there! Really, this is a several second exchange that can save a lot of time. They say you only need to be there during the one hour that you are scheduled, but it's a good idea to be there basically the whole time. And when you’re at your poster, In Baby Attach Mode reminds us to introduce people we know to each other. (I)t’s a small gesture to introduce people to each other, but that it makes a huge difference in how you make people feel. Scicurious covers a poster presentation experiment (that I’ve featured here on this blog, but worth revisiting). Next, In Baby Attach Mode ponders dress sense at posters. Virginia Hughes also picks up the cause on Twitter. Finally, to round out the trilogy, here's a full-length post on conference clothing. The Cellular Scale finds another candidate for worst poster ever at Neuroscience. No graphs only words, well one picture of a whole brain, and TABLES! oh the tables that should have been graphs! But it wasn't just the layout, the presentation was rambly and confusing. (I) saw everywhere from 6-40+ in my row of posters. My response: As many as you need to tell the story. Just remember that posters are good for short stories, not epic novels. Title items that cause me to skip your poster “mechanism of”. Why do people title their poster/talks “evidence for [phenomenon]”? Why not just say what the phenom is, we assume you’re presenting evidence. Someone should start a DejectedPosterFace tumblr for that look students have when they're standing at their poster all alone. So sad! Your wish is my command, sahib. Jason Snyder finds people who seem to be all postered out. And I love this picture from Shelly Fan on a plane going out from New Orleans after Neuroscience. And do not make jokes about their resemblance to any sort of weapon! Shelly Fan made her own poster tube strap. If someone does this next year, it will become tradition. NeuroPolarBear has a round up with great tips for organizers. But what really caught my attention at SfN 2012 is that Voytek and Warp were presenting “The Adventures of Ned the Neuron” and its development via a “dynamic” poster. That means they presented their story and concept on a large digital flat-screen rather than on the traditional posterboard in the conference center. No thumbtacks needed. Warp tells me that SfN contacted her and Voytek to tell them they’d been selected as part of a pilot program prior to the meeting. 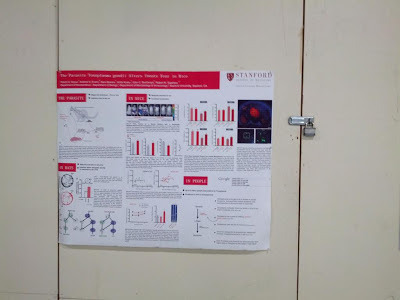 Apparently, there was one dynamic poster presented during each poster session over the course of the conference. Presumably, if the feedback is good, we’ll see more neuroscientists presenting their colorful, three-dimensional data on flat-screens in the future. 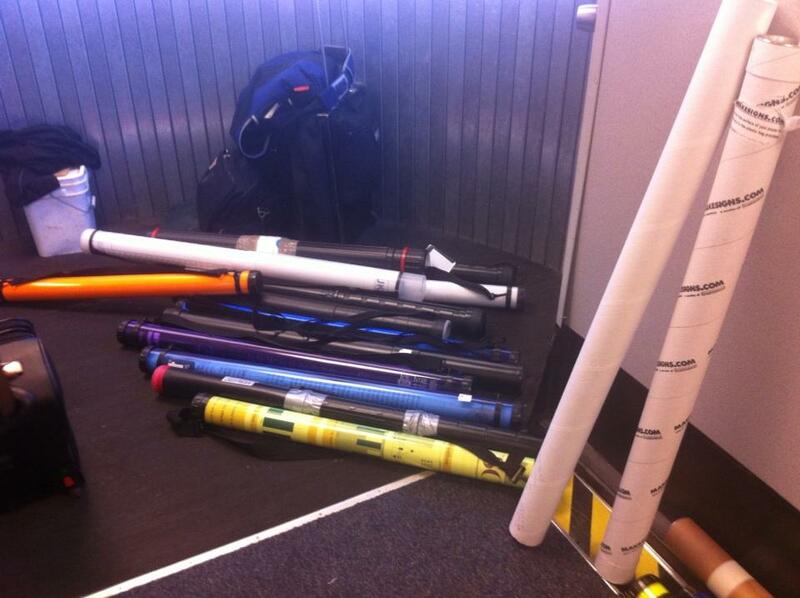 Say goodbye to those poster tubes and trying to cram them into the overhead bin on the airplane, kids. Neuroscience was not the only conference this month. We also had the Society for Vertebrate Paleontology. 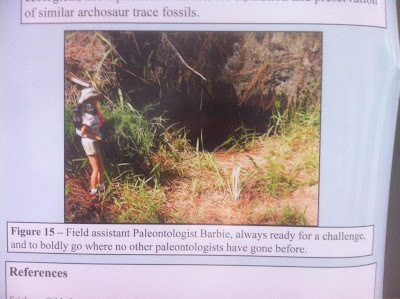 And I have to say that it’s a paleontologist, Tony Martin, who gave me the biggest smile this month in poster-related news with... Paleontologist Barbie. This is one of my favourite things about posters: you can do things that you cannot get away with in a paper. I went to see the posters every day during lunch break when the posters are already up, but people are not there yet. I checked out every single poster, in order to get a feel for the field as a whole. Then I would focus on, and completely read, 4-5 posters each day. In the afternoon, when the poster sessions starts, I homed in on those 4-5 posters and talked to the authors, asked more questions. A number of those posters will end up here on our site, written by authors on the Guest Blog, over the next several weeks and months. Finally, a bit of a “how to” article about making inforgraphics look good without compromising the integrity of the information. Hah, I saw that poster up the day before that, too (Wednesday, assuming you mean it was up on Thursday). I wonder how long the airport's going to let that hang?